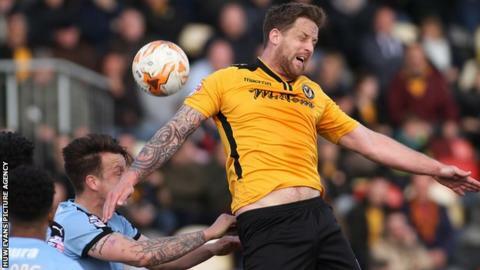 Cambridge United maintained their revival and promotion aspirations under manager Shaun Derry with a 1-0 win over Newport County at Rodney Parade. Cambridge are three points off a play-off spot while Newport's cushion over the bottom two is cut to 11 points. The Us had the better of a low quality contest, with Newport failing to produce a single effort on target. James Dunne scored the winner midway through the second half after smart work from Luke Berry. Newport County manager Warren Feeney told BBC Radio Wales: "It was very frustrating. No way did I think we deserved to lose a game - I thought we deserved to win the game. "But we're not being clinical in both boxes. I don't think we're being ruthless enough. "We've just got to pick them up now and go next week. We need one win and I've every confidence we can get that. But at the moment we're in that little bit of a lull." Match ends, Newport County 0, Cambridge United 1. Second Half ends, Newport County 0, Cambridge United 1. Attempt missed. Andrew Hughes (Newport County) left footed shot from the centre of the box is too high following a set piece situation. Substitution, Cambridge United. Robbie Simpson replaces Ben Williamson. Attempt missed. Lenell John-Lewis (Newport County) left footed shot from the centre of the box is too high following a set piece situation. Souleymane Coulibaly (Newport County) wins a free kick in the attacking half. Foul by Max Clark (Cambridge United). Corner, Cambridge United. Conceded by Janoi Donacien. Attempt missed. Souleymane Coulibaly (Newport County) right footed shot from outside the box is close, but misses to the right from a direct free kick. Substitution, Newport County. Souleymane Coulibaly replaces Scott Boden. Substitution, Newport County. Janoi Donacien replaces Danny Holmes because of an injury. Corner, Newport County. Conceded by Darnell Furlong. Corner, Newport County. Conceded by Luke Berry. Substitution, Newport County. John-Christophe Ayina replaces Scott Barrow because of an injury. Goal! Newport County 0, Cambridge United 1. James Dunne (Cambridge United) right footed shot from the centre of the box to the bottom left corner. Assisted by Luke Berry. Max Clark (Cambridge United) is shown the yellow card for a bad foul. Danny Holmes (Newport County) wins a free kick in the defensive half. Attempt missed. Harrison Dunk (Cambridge United) left footed shot from the left side of the box misses to the left. Attempt missed. Leon Legge (Cambridge United) header from very close range misses to the left following a corner. Corner, Cambridge United. Conceded by Scott Barrow. Attempt missed. Lenell John-Lewis (Newport County) right footed shot from the centre of the box is too high.